The world of investment management has developed into a complex industry with a very broad range of products, fund managers and investment options for clients. This makes implementing financial advice particularly onerous for advisers. The requirement to stay abreast of these fund management options takes time away from an advisers main role: to provide good, independent financial planning advice to clients. To solve this problem, we have engaged with Fundhouse to assist us in advising on your investments. 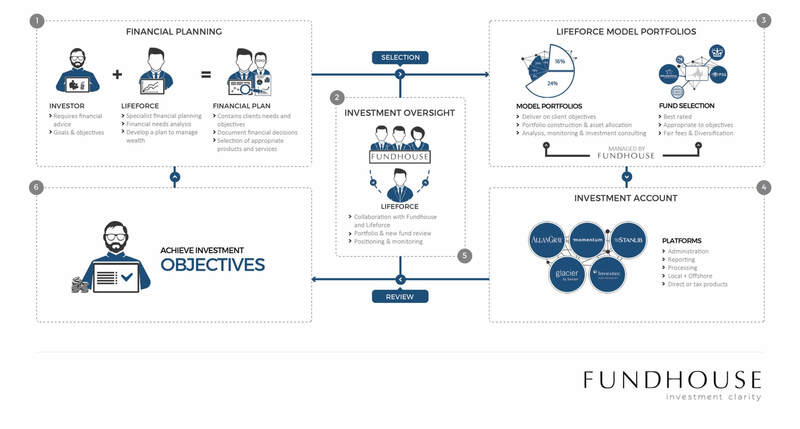 Fundhouse is an established industry expert in the field of fund research and investments, and offers a customised service which allows us to implement our advice in the most efficient way possible. This benefits our clients directly and provides an additional level of comfort with respect to the quality and suitability of our investment options. Why use Fundhouse to assist with our Investment Advice? Together with Fundhouse we have developed a customised range of ‘Model Portfolios’ which represent the best investment view and the most appropriate way to implement our financial planning advice. These portfolios target a range of client outcomes and are reviewed and managed on an ongoing basis by Fundhouse. The portfolios consist of a range of leading funds which collectively deliver your investment solution. This is based on Fundhouse’s extensive and independent research process and portfolio construction expertise. Our relationship and services to our clients remains exactly the same. Once we have established your investment requirements we decide, with our clients, which of the Lifeforce Model Portfolios to utilise as part of the financial plan. From then on the portfolios are managed on a continuous basis and we can focus on servicing our clients and their needs. The overall Fundhouse service offering is actively monitored by ourselves to ensure that our clients receive leading service levels they expect. What benefits are there for me, the client? Leading fund research, less administration, targeted portfolios result in improved investment results. Doesn’t my adviser perform this role already? Yes, and will continue to do so. The increasing complexity in the market place makes this a challenging role to fulfil and through Fundhouse’s contribution this will add value to our clients. The fees start at 0.20% of your investments per year and reduce from there. Yes, they are 100% independent and owner managed, which means they only recommend the best funds available in the market. Is Fundhouse authorised to perform this service? How can I cancel this service? The service can be cancelled at any time by the client. The service falls away and our clients’ funds remain as they were invested prior to cancellation. There is no requirement to sell out or disinvest. The Investment Platform we use to administer your investments has access to them. Fundhouse is only able to rebalance your investments according to the selected Model Portfolio and does not have direct access to your investments. Fundhouse is a leading investment adviser specialising in fund research, ratings and portfolio construction services. We help clients manage investments on behalf of the end investor. Our experienced team understands the complexities of the fund management world. We apply this knowledge alongside a client-first mindset to improve the outcome for the end investor. Our client base includes financial advisers, investment platforms and other users of fund management services, where we can bring our qualitative, research-driven perspective and apply it within their businesses. We have been assisting clients build investment capabilities since 2001. Fundhouse was founded in 2007 by professionals from the investment management industry. We currently operate from offices in South Africa and the United Kingdom, where we cover the local and global fund industry first hand. Our business is 100% independent and owner managed which means we can offer objective advice and services in the best interests of our clients. Send us your details below and let’s plan your future together.